We don't want to say "we told you so" - but just read this article we posted in 2011. We precisely described and satirized the culture and conditions in German media that created the Relotius train wreck years before it happened. It is important to remember - however - that the group of people calling the shots in the German media in 2002 and 2003 are essentially still running the show today. Given the right political conditions and the media's tendency to follow larger political patterns, they would gladly return to the high-pitched anti-American hysteria that flooded German media only a few years ago. Perhaps the most fascinating aspect of the entire Spiegel-Relotius scandal is that the lies and fabrications that he fed to his editors back in Germany were not random in the least. They followed a precisely constructed blueprint of stereotypes nourished for decades by the anti-American editors and media and political elites in Germany. Der Spiegel's Enemy Has Many Faces and One Name: "Amerika"
In a nutshell, the Relotius lies and fabrications reflected exactly the American boogeyman that has been sold to Germans for years now. We even put together a list of these stereotypes in 2008 - THIS IS NOTHING NEW - and they are still current today if you simply replace the word "Bush" with Trump". That's always the thing with these scandals. The media big shots always come off as if they have been insulted about their shenanigans being revealed. In this case, the other major media outfits are rallying to defend Der Spiegel. In the dreaded private sector, competitors are always quick to take advantage of the mistakes of a competitor. In the main stream media, the opposite is always true. They circle the wagons and begin lecturing the hoi polloi about the dangers of questioning the media. That is the real cause of these scandals. For a long time, the mass media in the West has been a mono-culture. You can't have a career in the media if you don't hold all the right opinions. To call the media an echo chamber for the left is to understate the problem. The better analogy is a school of fish. Each individual just reacts to those around him, giving the effect of the school having agency as a whole. What looks like collusion is just the result of a uniformity of mind, experience and social class. Der Spiegel Commentary: Obama Failing because of "Hate-Mongers, Gun Freaks and Tea Party Demagogues"
Case in point: When SPIEGEL attempted to exploit the current economic crisis with another decidedly anti-American cover and feature article with all the usual anti-American clichés designed to pander to the magazine's predominantly anti-American German readership, English-language readers spoke out. The headline quickly changed from "America's arrogance" to "Is America Arrogant?" And let's not forget our 2005 write-up on the somewhat similar SPIEGEL "expose" on Kannapolis, North Carolina. 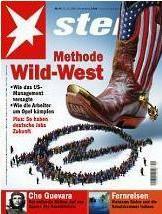 And now just finishing our tour of the tip-of-the-iceberg - let's not forget SPIEGEL's admission to Jeff Gedmin in 2004 that the anti-American stereotypes are editors "just trying to please our million readers." Gedmin's 2004 work "Mad About Us" is just as relevant now as at any time. The examples go on and on and on. Like Godzilla awakening from his volcanic slumber - we have re-emerged to global relevance to continue our rampage against bias in German media. From 2003 to 2008 - we went all-out to expose fake news in German media before the term even existed. Now we are posting again - and no less than Instapundit and the U.S. Ambassador to Germany - the Honorable Richard Grenell - have recognized the continuing relevance of our work. 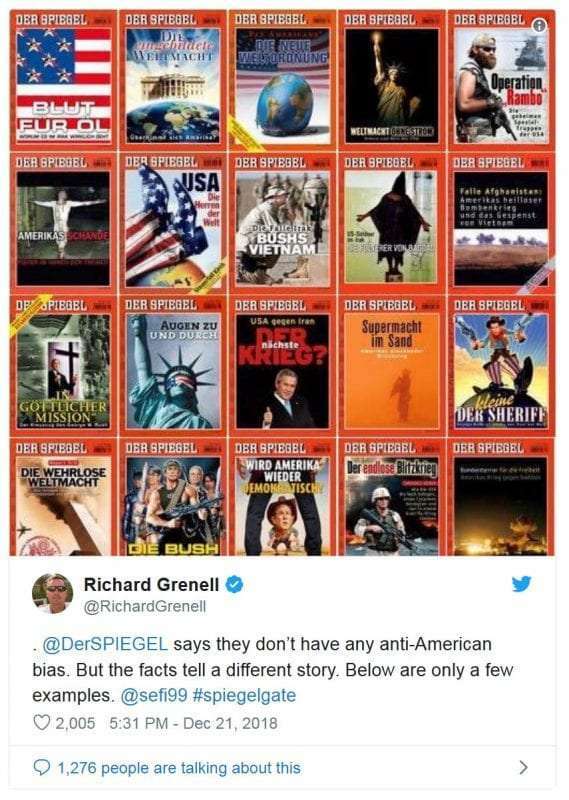 Just a couple days ago, after we posted our first item in years, the Ambassador tweeted out a collage we put together to demonstrate the incessant anti-Americanism-for-profit that Der Spiegel has employed for decades now. We are both honored that he would highlight our work - and grateful that he has taken up the mantle that we carried for years. Finally - a person in a position of power is highlighting the ugly truth - and confronting the so-called "Amerika Experten" who have been committing journalistic malpractice for years. It is as if our long-held wish is finally coming true. And Mr. Ambassador - we further find it quite interesting that the "professional" ranks of editors and journalists at Spiegel did not catch Mr. Relotius' obvious fabrications even though some commenters on SPIEGEL ONLINE were pointing it out well before the scandal exploded - only to have many of their observations posted as comments deleted. It will be interesting to see if this is ever acknowledged by the Spiegel staff and leadership. So Mr. Ambassador - we will say this: You and our colleagues at Instapundit and around the blogosphere have inspired us by championing our cause. You have inspired us to renew our mission - to renew our work - and to once again join the fray. We hope that you - and others in positions of influence in Germany and the United States continue to publicly point-out and call-out the blatant bias that we have seen for so long at Der Spiegel (and many other media outlets) - and point out the corrosive impact it has had and continues to have on German-American relations. If there is anything we can do to contribute - don't hesitate to ask and don't hesitate to continue to highlight our work. What amazed and frustrated us in our earlier years is that no one did what you are now doing - so thank you. At the end of the day - it still comes back to this fundamental point: When supposedly "well-informed" Germans who read media like Der Spiegel live in a world clouded by lies of omission - and emphasis on the negative - is it any wonder that they have a poor and incomplete opinion of the United States and that transatlantic relations suffer as a result? "German news magazine Der Spiegel has sacked an award-winning staff writer after accusing him of inventing details and quotes in numerous stories. Claas Relotius "falsified articles on a grand scale and even invented characters", Der Spiegel said. An investigation into a story by Mr Relotius about immigration and the US-Mexican border revealed that he had fabricated information about seeing a hand-painted sign in a town in Minnesota that read: "Mexicans Keep Out." Fraudulent information appeared in other stories including one about inmates at the US military prison at Guantanamo Bay and another about the US NFL quarterback Colin Kaepernick." Now wouldn't that have been quite fitting for the Amis to have an Auslaender Raus equivalent? Nothing would be more satisfying to the leftist-German psyche than to bring the cowboys right down to German standards - mitigating some pent-up xenophobia-guilt. And on another front, Marc Pitzke - Amerika-Experte extraordinaire - has joined the rest of the Angry Left media in making nice with and even lauding the McCain/Bush "good Republicans" who they once bashed to no end so long as they threatened to exercise any real power. Now that they stand at odds with Trump, however, they are newfound heroes and lovable old foils. Spiegel's crack Amerika-Korrespondent Marc Pitzke strikes again! Apparently - SPIEGEL Online has gotten an extra early scoop on the death of GHW Bush! Or perhaps its a bit of wishful thinking on the part of Marc Pitzke - who has already prepared a masterpiece of false praise, which is, in fact, a poorly disguised litany of attacks against the elder Bush's son George W.
Pitzke gets the usual low blows in: The mandatory griping about endless war, torture and how terrible a place America has become since the first Bush governed in a more innocent time. Ah the good old days! But most importantly - SPIEGEL gets it wrong - again. This isn't the first - but perhaps one of the most dramatic examples of the magazine's total bias and lack of professionalism. Pitzke's next story: Elvis still lives - in New York - in the studio next to mine! Today I attended a seminar at the Goethe Institute in Washington DC on Germany and the challenges of terrorism. In attendance was Stefan Aust, until recently the editor-in-chief of Der Spiegel. During the questions-and-answer period, I introduced myself and asked him whether he thought it would be fair to say that Der Spiegel and other German media had sometimes veered from legitimate criticism and questioning of the United States over the past few years into anti-American populism designed to profit from some need of the readership. Not surprisingly, he replied with a "no" and went on to say that he felt that his publication's coverage of the run-up to the Iraq War was fair and included voices from both sides - even those who supported the war! It is interesting here to remember Jeff Gedmin's encounter with a Spiegel reporter a few years back. A look at our archives and the covers below may also lead some to question Herr Aust's conclusion. Endnote: The Goethe Institute organizers did mention that recordings from the seminar would be on NPR. I just hope they don't play the question asked by a woman before me - which was an embarrassing monologue that went on with no real point for nearly 10 minutes. Power and Lies: Der Spiegel Declares Iraq War "Lost"
There are several troubling situations in the world at the moment: There is genocide in Darfur. There is unending unrest in Congo. The war in Chechnya has claimed thousands of lives with no end in sight. North Korea seems on the brink of exploding a nuclear weapon. Islamic extremists continue to threaten the civilized world. But wait a minute. There are elections in four weeks in the USA and a new Bob Woodward book that casts the Bush administration in a less than favorable light. And believe it or not, there are German publications that actually believe they can influence the outcome. One in particular is "Der Spiegel." Let's not forget the disparaging covers they ran in the run-up to the 2004 election. 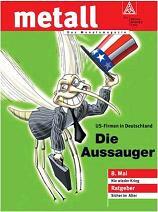 Recently, it seemed as if "Der Spiegel" had backed away from its campaign of spectacular, America-bashing covers. The last was a special on torture in Abu-Ghraib...two years after the scandal broke. 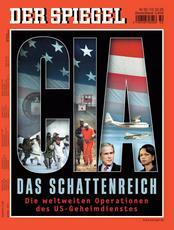 It was in the typical SPIEGEL agitprop mold: "America's Shame: Torture in the name of Freedom". Very much in the tradition of earlier covers on Afghanistan and Iraq also intended to point out supposed American hypocrisy with simple, catchy headlines: "Bombing-Terror for Freedom" or "America's Unholy Bombing War" or "Operation Rambo" or "Blood for Oil." We all know that defeat for America (and particularly Bush) is one of the deepest fantasies of many in the German media and on the Angry Left. How else could you explain all of the Iraq = Vietnam comparisons? How else could you explain the self-censorship in German media in the run-up to Iraq in which pro-war viewpoints were systematically discouraged and even shut out? How else could you explain the massive self-censorship in German media when it comes to reporting positive progress in Iraq? In all of this, let us make one bold prediction about this edition of "Der Spiegel" before it has even come out: The magazine will have made absolutely no real attempt to interview or fairly represent the opinions of anyone who would defend American efforts in Iraq or contend that the war in Iraq has not already been hopelessly lost. In other words, just as in the run-up to Iraq, there will be massive, self-imposed censorship of unpopular views. "Der Spiegel" simply does not possess the integrity and intellectual honesty to present its ideologically-inclined readership with an honest, two-sided debate on Bush and Iraq for fear of losing subscriptions and aggravating its customers. The simplistic, inaccurate, black-and-white coverage of the United States that has predominated at "Der Spiegel" for years now is particularly ironic considering that the magazine and its readership view themselves as paragons of nuance and profound discerners of the world's many shades of gray. The same people who so mindlessly demonize the United States with the most simple-minded, propaganda-like slogans (Bombing-Terror for Freedom - Torture in the name of Freedom - Blood for Oil - Bush is a Liar) are the same people who violently oppose what they perceive to be the "for-us-or-against-us" stance of the Bush administration. And allow us remind our media friends at "Der Spiegel" of just one fact: The "war" in Iraq has certainly been a difficult and challenging one with many setbacks: But the battle for Iraq isn't over and it hasn't been lost just yet. We know that our good friends at "Der Spiegel" would love defeat for the United States in Iraq to become a self-fulfilling prophecy, but if there has been one fatal flaw in the history of the German character, it has been the premature and over-confident assumption that one's opponent is defeated before they have actually been defeated. And allow us to remind our friends at "Der Spiegel" of something else they may have forgotten: American defeat in Iraq would represent a catastrophe for the millions of people of Iraq and possibly for the wider Middle East, and serve as a major setback for efforts to politically reform (and yes democratize) the region. American defeat in Iraq would almost certainly transform wide swaths of the country into terrorist safe havens and embolden and strengthen Islamic radicals as never before. An American loss in Iraq would leave a nation of millions at the mercy of radical sects and outside governments and would likely end in a civil war that makes today's sectarian strife and car bombings look like a picnic. An American loss in Iraq would leave that nation's vast oil wealth in the hands of unknown groups battling for power, fueling further conflict, bloodshed and terrorist activity. In other words, American defeat in Iraq would be a major loss for the entire civilized world, including Germany and Europe and would make the world significantly less safe. But to SPIEGEL, none of that matters. Short-term defeat and humiliation for Bush and America trump any long-term humanitarian and geopolitical considerations. The massive humanitarian disaster that followed American defeat and withdrawal in southeast Asia - with millions of deaths and millions more refugees - was of little interest to "Der Spiegel" and other media elites. The same has been and would be true in Iraq. Saddam's atrocities have received only a tiny fraction of the coverage that Abu-Ghraib and Guantanamo have received. The chaos, death and suffering that would follow an American defeat in Iraq on a massive scale would also be of little interest to the high minded humanitarians at publications like "Der Spiegel." Right now, SPIEGEL reporters are busily rehabilitating and canonizing Bob Woodward for returning to the fold. They honestly seem to believe they can influence the upcoming US mid-term elections. They know they can sell more magazines with spectacular covers. And any hope of constructive transatlantic dialog and understanding between Germans and Americans continues to dwindle as the media's innuendo, cynicism and sensationalism continue: Bush lied and people died! According to SPIEGEL's print edition of March 20, 2006 (p. 17), due to tough U.S. resistance, Germany will get only limited access to the UN Security Council talks on Iran's nuclear program. Der Spiegel wrote the U.S. Ambassador to the UN, John Bolton, refused entry to his German counterpart Günter Pleuger to the so-called P5 talks at the UN, and he continues to persistently call EU-3 proposals "British-French proposals". Mr. Pleuger indeed is hard to imagine as participant in any talks with the U.S. at the UN. I vividly remember his sneering, arrogant tone during the UNSC talks pre the Iraq invasion. . I gather Mr. Bolton felt he could do without this guy's advice. SPIEGEL: "America's Shame: Torture in the Name of Freedom"
"America's Shame: Torture in the Name of Freedom"
Torture in the name of freedom? Since when has America advocated torture as a means of promoting freedom? When someone is tortured or abused in a German jail in violation of established standards, does that mean the German government is torturing in the name of democracy as well? When illegal immigrants suffocate or commit suicide in German custody is that also in the name of democracy? It is as if the United States had never addressed the issue. It is as if the McCain bill torture ban had never been passed by Congress and signed by the President. This is a dangerously cynical equation of two concepts. Particularly in a Europe where the general public is already so jaded that many no longer believe in the concept of freedom. Why? Because instead of reporting on the systematic violation of human rights in nations like North Korea and Iran the German media finds it necessary to exploit two year old photos of Abu Ghraib for profit (again and again). Never mind that Saddam's Abu Ghraib was a thousand times worse or that hundreds of thousands are starving to death in Kim Jong Il's gulags. There is no need for context in the world of asymmetric journalism. Germany opposed toppling Saddam and his regime of mass graves. It was not Germany or the UN but the United States that ended the killing in the Balkans. And while SPIEGEL lectures us on "America's Disgrace," the German government is out actively promoting business ties and trade fairs with the Sudanese government as the slaughter in Darfur continues. Ex-Chancellor Schroeder favored lifting the EU arms embargo on China, perhaps the world's most prolific violator of human rights. German efforts to stop Iran's nuclear ambitions have proven to be more of the same impotent diplomatic dupery that too many Europeans support at all costs. In the meantime the Iranians have taken advantage of the stalling to advance their insane ambitions to destroy Israel and threaten the world. The most disgraceful aspect is that Germany has repeatedly coddled, condoned and even assisted regimes of dictatorship and mass murder despite its own disgraceful national history. And then, in an effort to relativize its own shameful history and diplomatic impotency, German media publications like SPIEGEL pump the numb, jaded audience full of the vile America hate to which so many have become emotionally addicted. The irony of it all is that publications like SPIEGEL would not even have the freedom to print this exploitative trash had it not been for the massive sacrifice in lives, blood and toil of American soldiers to liberate Germany from Fascism and defend it from Communism. No context. No differentiation. Shock value. Manipulation. Emotionalism. Sensationalism. And then the same publication dares lecture us on the dangers of anti-Americanism. Undermine and tarnish America's moral standing. Disgrace the US military establishment. Paint the Iraq conflict as a lost cause. Ignore good news. Attack and discredit President Bush. Exploit the "clash of cultures" divide. "The images from Guantanamo and Abu Ghraib will endure, and they will haunt America for decades to come. A global power can make mistakes and give in to folly, but when its moral foundation begins to crumble, it is constantly forced to deal with the images of its own humiliation and disgrace." That is what it is really about for SPIEGEL: Long-term humiliation and disgrace for the United States. Abu-Ghraib as the new Mai Lai. This is not about thoughtful, constructive criticism. This is not about genuine, collegial interest in seeing America right its wrongs. This is not about transatlantic dialog and understanding. This is about a harmful, vindictive rush to the moral high ground at America's expense. Americans should recognize this shameless bashing for what it is and become extremely wary of any and all criticism they hear blaring from across the Atlantic. Americans must begin to tune-out and turn-off the hateful voices that seek only to profit from their misfortune. By the way, don't ever expect SPIEGEL to dedicate a cover to this story (no it doesn't matter that it's actually current and not over two years old): America's Pride. Here's a great cartoon from Cox & Forkum. Endnote: For more on this topic, see our recent posting: "Valley of the Wolves Iraq: "Today I hated Americans more than ever." Time for SPIEGEL to go back and reflect on our earlier suggestions, particularly point #6. Politically Incorrect has a highly worthwhile German-language post on reactions to the release of more torture pics. We changed the translation of "Schande" from "disgrace" to "shame" to match SPIEGEL's English translation. Both "disgrace" and "shame" are acceptable translations for "Schande." Another highlight of Germany's #1 investigative journalism magazine: the current edition of left-wing, fiercly anti-American SPIEGEL presents an article on "THE EMPIRE OF SHADOW - The worldwide operations of the U.S. Secret Intelligence Service", and the picture on the cover shows ... members of the Canadian military! "BLACKOUT IN AMERICA - The dazed world power was plunged into chaos by the largest blackout in the super power's history: Cities in the dark, planes on the ground, and a nation marching single-file like geese through the darkness. The land of limitless opportunity was shut off by a couple of exploded fuses. A world power between perception and reality - SPIEGEL TV with observations from a country whose lights have gone out." 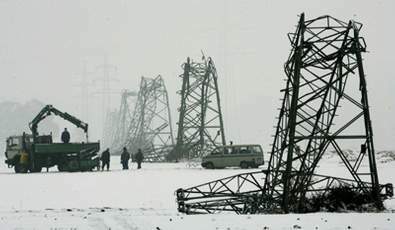 Last week the lights literally had gone out in parts of Germany, with hundreds of thousands of Germans without electricity for days. And SPIEGEL's reporting - and that of the rest of the German media - was full of sympathy with the poor folks who had to sit in the dark and the cold. 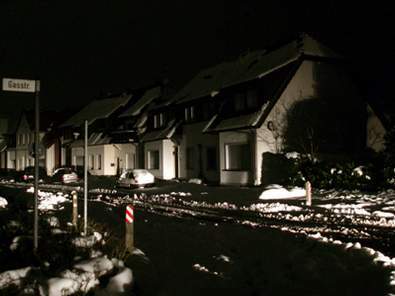 "BLACKOUT IN GERMANY - The dazed European power was plunged into chaos by the largest blackout in the economic super power's recent history: Cities in the dark, planes on the ground, and a nation marching single-file like geese through the darkness. The land of social justice was shut off by a couple of inches of snow. A European power between perception and reality - SPIEGEL TV with observations from a country whose lights have gone out." How would you expect the German media to react if two weeks of violent rioting broke-out in the United States and President George W. Bush failed to respond to the crisis for the first ten days? Certainly, one could expect numerous articles pointing to the "social decay" of the American system and the dangers of too little "state" and too great a reliance on "free markets" and "capitalism" as was the case during the Katrina tragedy. And, without a doubt, one could absolutely expect to see the cover pages of magazines like "Der Spiegel" and "Stern" filled with the usual images of condescending Schadenfreude, accompanied by headlines such as, "America in Flames" or "Riots: The Forgotten Americans" or "Chaos in America: Social Injustice Explodes". One could also expect, with a high degree of certainty, that the riots would be interpreted as evidence that George W. Bush is under further "massive pressure" and on the brink of failure and impeachment. The media would scream ceaselessly about the fact that Bush did not react immediately and wonder over and over and over again: "Where was the cavalry?!" Bush would again be portrayed as the purveyor of a cold, heartless and unjust political vision founded upon neo-conservative, capitalist principles that have supposedly left America devoid of "social justice". The media would further point the finger at the Bush administration and accuse it of complacency despite "having known" conditions were rife for social unrest. Even more "conservative" magazines like "Focus" also took little if any note of the riots on their cover-pages. Why might that be? Why are the French treated with such discretion while the Americans are attacked, impugned and abused at every opportunity? Why are the same German media that so diligently seek-out scandal and disorder in the United States so content to downplay and even ignore such issues in France? The answer to these questions is simple: Ideology. The French elites have grown to be the greatest intellectual allies of the German elites. They stand for the same model of "social democracy" and resistance to what is perceived to be "American-style" global capitalism. To criticize the failings of the French would be to criticize ones' own failings. To expose the many flaws of the French "social" system would be to expose the many flaws of the German "social" system. To overemphasize the failure of the French to integrate minorities and end discrimination in housing and the workforce would be to overemphasize the same failings in Germany. To question the viability and stability of French multiculturalism in the face of a rapidly increasing Muslim minority would be to question the same in Germany. To scrutinize the impacts of mass unemployment in Paris would be much like scrutinizing the impacts of mass unemployment in Berlin. And so German media don't criticize, expose, overemphasize, question or scrutinize the French as they would the Americans. And when people come to this site and ask us what we mean by "bias" in the German media, we can point to no better example than the recent lack of salacious, drooling coverage of the French riots that one could have expected with absolute certainty had they taken place in New York or Los Angeles. One need only look at the cynical, Schadenfreude-filled reaction to Katrina in the German media to erase any doubt about that. In a recent article on the Vietnam War and the 1964 Tonkin Gulf incident entitled "The Torpedo Attack that never was", SPIEGEL ONLINE draws some sinister historical parallels to modern day Iraq. That should not come as a big surprise, of course, since deep-down the magazine and its anti-American readership would desperately like to see the Iraq War develop into another humiliating defeat for the United States. "The Vietnam War divided the USA in the seventies - and the nation is still dealing with it. American historians have now found out that tricks and cover-ups already played a big role at the beginning - a parallel to the Iraq war." There is absolutely no attempt to hide the intent of the article: America is still supposedly haunted by Vietnam and the war's "beginning" is parallel to that of the current Iraq conflict. Never mind that the Vietnam conflict hardly began in 1964. Never mind that US involvement in Vietnam stretched back well into the 1950s. Never mind that the Gulf of Tonkin incident was hardly the only factor that drew America into Vietnam. "Now parallels to the Iraq War are being drawn that suddenly make the happenings in the Gulf of Tonkin interesting again. Because in both cases the claims of the intelligence services played a role that collapsed like a house of cards, but were still used to justify a war. In the USA a debate is swirling about the responsibility of the President. George W. Bush sees himself accused of lying, since no weapons of mass destruction have been found in Iraq. At the same time an old trauma has returned to the populace: The Vietnam War." Of course. Hoelzgen wants desperately for us to believe that an "old trauma" is returning to the United States. And for SPIEGEL ONLINE readers that translates into one simple thing: Iraq = Bush's Vietnam. Nothing could be more pleasant to the ears of SPIEGEL ONLINE readers than the wishful thinking of author Joachim Hoelzgen, who naturally never informs them that another side to the debate exists. Hoelzgen never mentions the view, held by many, that there is no good evidence that Bush lied or covered-up anything related to going to war. In fact, many Germans simply assume that Bush lied because they rarely - if ever - hear the "other side" of the story and simply believe what their media is telling them. The result is a transatlantic canyon of misunderstanding marked by conversations that take place on completely different wavelengths. But let's be honest. We know the German media by now. Why would Mr. Hoelzgen want to challenge himself or his readers by mentioning the other side or bringing up differing viewpoints? It would ruin the wonderful premise of his piece that his readers so crave: Iraq = Bush's Vietnam. And besides, predicting American doom is a tried and tested formula for selling books and magazines in old Europe, so why disturb the lucrative status quo and rock the boat for a little thing like the truth? "And like John F. Kennedy, Johnson and Richard Nixon initially, McNamara clung to the belief that Vietnam was a cornerstone of the free world which, if it came loose, would mean the Communists would take over all of Southeast Asia as a result. They didn't realize that the main goal of Ho Chi Minh and his generals was in no way the conquest of neighboring countries, but instead the reunification of Vietnam." What pious historic ignorance. So what, exactly, were the objectives of the Soviet leaders in Moscow were who were bankrolling Ho Chi Minh and supplying his armies with billions in weapons and aid Mr. Hoelzgen? I'm sure that they were only interested in the peaceful "reunification" of Vietnam as well and had no further ambitions, just as they were only interested in bringing "peace" and "unity" to Afghanistan not long thereafter. And of course Mr. Hoelzgen forgets to mention how entire North Vietnamese divisions occupied swaths of Cambodia and Laos during the war while so-called peace demonstrators in the West screamed about every American incursion into those supposedly "neutral" areas. Mr. Hoelzgen conveniently forgets to mention the massacres, torture and terror implemented on a mass scale by "Ho Chi Minh and his generals" during and after the war. Mr. Hoelzgen never mentions the incredibly brutal occupation of Cambodia by Communist forces and the mass murder of 2 million of that nation's 7 million inhabitants, something that would have never happened had US troops remained in Southeast Asia. Mr. Hoelzgen never mentions the hundreds of thousands of Vietnamese who fled, drowned, were imprisoned, tortured, starved and murdered by "Ho Chi Minh and his generals" during and after the war, (a process that continues to this day, largely ignored by the European Left.) Mr. Hoelzgen never mentions that the US lost not the war but the peace in Vietnam by failing to aid the South Vietnamese on a level proportionate to the aid the North received from the Soviets after withdrawing in 1973-4. Instead, readers are presented with the usual one-sided view of Vietnam and again fed the fallacious comparison to Iraq, not because the comparison is true or particularly accurate, but because it represents the magazine's desired outcome: Defeat for the United States. And, as a finishing touch on this revisionist hack job, SPIEGEL ONLINE includes a series of 9 images to further reinforce the left's own revisionist stereotypes of Vietnam, Iraq and the USA. George W. Bush: "Ready for War"
In closing, we at Davids Medienkritik would like to suggest a new title for this latest SPIEGEL ONLINE article on Vietnam that more accurately reflects its cynical revisionist view: "Vietnam: The Communist Atrocities that never were." And, in a very real sense, the magazine's willful decision to gloss-over Communist atrocities in Southeast Asia is remarkably similar to its willful decision to largely gloss-over Saddam Hussein's repeated campaigns of mass murder and invasion. So clearly: When one objectively tallies the number of articles the magazine has published on real and alleged American transgressions in Vietnam, Afghanistan or Iraq and then compares that total to the number of articles the magazine has published on Communist genocide in Southeast Asia or Baathist atrocities in Iraq, the proportion will reveal a staggering revisionism completely out of whack with historic reality but entirely in sync with the political leanings of the magazine's readership. Sadly enough, SPIEGEL ONLINE is largely representative of most German media in this respect. Endnote: In related news, SPIEGEL ONLINE is currently celebrating "Europe's Peaceful Revolutionaries" as the inheritors of Che Guevara and Gandhi on its most recent magazine cover. "The Inheritors of Gandhi and Guevara: Europe's Peaceful Revolutionaries"
Here again, the magazine is overlooking Che's less than "peaceful" history as a Communist leader in order to glorify the European Left. Update: In a letter to the editor, David Harnasch writes (in German) that Gandhi must be turning over in his grave.